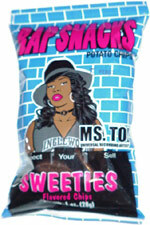 Taste test: These are good sweet barbecue chips, with a definite emphasis on sweet. They're thin and crisp, with lots of flavor powder. There's no heat to these chips that I could discern, and also no aftertaste.